Frozen vegetables. They are quick, easy, mess free and who isn’t a fan of foods like that? For those who work all day long, come home to a house full of kids or pets, having the time to cook a full meal by scratch is just impossible. For years I have always worked hard at making sure the main part of our meal (the protein) was home cooked, but I rarely paid attention to those pesky vegetables I always cook. Being able to pull a bag out of the freeze, pop it into the microwave, cook them for 5 minutes, and when the microwave dings you have instant vegetables — was amazing. However, lately my husband and I have been trying very hard to stay away from frozen vegetables when making our dinners. In general we have been working very hard to stay away from processed and already prepared foods. (Mark has been super sad that we have not restocked his supply of pizza rolls in months, but he finally admitted the other day that he actually does not miss them!) Not that frozen vegetables are horrible, fresh vegetables just taste so much better — and in reality, cooking my own vegetables has not made cooking dinner any more complex than it was before — but it does make the end result taste so much better!! Preheat the oven to 425 degrees and make sure your rack is positioned in the lower third portion of the oven. Place the carrots and bacon on a rimmed baking sheet and drizzle with the maple syrup, salt and pepper. Toss well to combine. Bake the carrots until the bottom of the vegetables begin to caramelize and turn brown, which will take 10-15 minutes. Remove from the oven and carefully toss the vegetables. Return the baking sheet to the oven and bake an additional 10-15 minutes, until the vegetables are browned on both sides. Discard the bacon strips and serve immediately! Source: adapted from Martha Stewart. Sweet potatoes can be a tad bit intimidating; however, once you know how to make them you will never have an excuse to not cook sweet potatoes again. 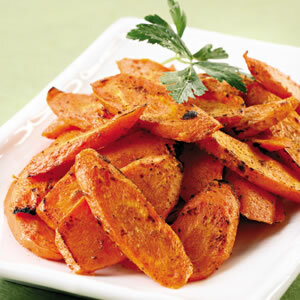 There are so many different things you can do with sweet potatoes!! Earlier I wrote about the Spicy Cajun Sweet Potatoes fries I made, and eventually I will tell you all about the amazing sweet potato casserole I made this past Thanksgiving! 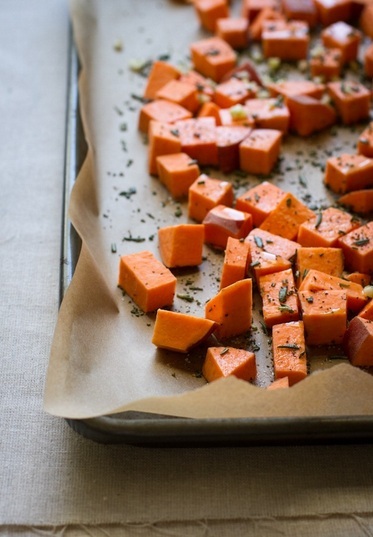 On a baking sheet spread out the sweet potatoes and sprinkle on the rosemary, garlic, salt and pepper. Drizzle the olive oil on the top and using a large spoon stir the mixture together until the sweet potatoes are well coated. Bake for approximately 30-35 minutes or until the potatoes are tender. Gently stir the potatoes every 15 minutes. Serve immediately! As I went about the day I continued to think about those delicious green beans. How hard could they be? 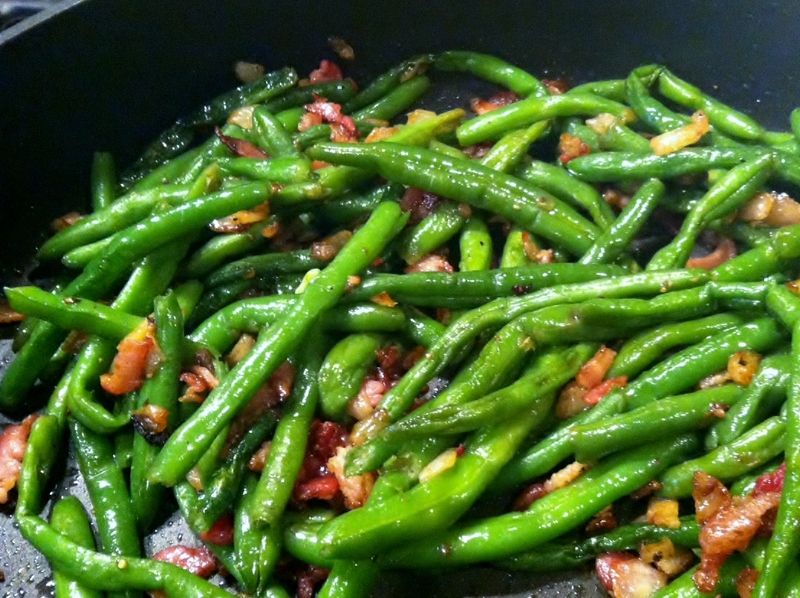 Green beans, bacon and onions. I can surely come up with a recipe that is close and boy did I ever! This is way green beans are meant to be eaten. Now, as a disclaimer, I never said this recipe is a healthy one!!!! I am sure you could tweak some of the ingredients to make it more figure friendly, but since I rarely make these I prefer to indulge in them when I do! Hope you enjoy these as much as Mark and I do! Put the raw green beans into a large stock pot and cover with water. On the stove, over medium-high heat, boil the greens for 8-15 minutes until they are tender. (Note: you want the green beans to be tender, not soggy!) Drain the green beans in a colander and set aside. In the same stock pot you used to boil the green beans, over medium heat add the bacon and begin to fry the bacon. Fry the bacon until it begins to brown, approximately 5-8 minutes and then add in the onions. Sauté the bacon and onions together for 3-5 minutes until the bacon is cooked and the onions are tender. Drain the bacon grease from the mixture, allowing about a quarter of the grease to remain in the pot. Add 2 tablespoons of butter and the garlic to the bacon and onions, and allow the mixture to sauté for 1-2 minutes together. Turn the heat down to low and add the green beans back into the pot along with another 2 tablespoons of butter, a pinch (or two) of red pepper flakes, and salt to taste. Cover the pot and let the green beans to sit for 3-5 minutes before turning off the heat and serving.